Earth fissure enlarged by infiltrating floodwater adjacent to State Route 56 near Beryl Junction. On January 8-12, 2005, a warm winter storm moved into southwestern Utah from southern California, causing widespread flooding and damage. The flooding extended northward into Escalante Valley in western Iron County about 35 miles west of Cedar City. Erosion by floodwaters revealed five earth fissures in western Escalante Valley. The fissures range in length from about 330 feet to more than 1300 feet, and form a discontinuous, nearly 6-mile long, generally north-trending zone roughly centered on the community of Beryl Junction. Locally the fissures show as much as 12 inches of down-tothe- east displacement. Where unaffected by flooding, the fissures were an inch or less wide, but were quickly enlarged as floodwater drained into them. In places, the floodwater eroded gullies along the fissures up to 10 feet wide and 7 feet deep. Local residents reported that floodwater flowed into the fissures for a period of a day or more during the peak of flooding, and that a vortex formed in the floodwater over at least one fissure. Escalante Valley is a sediment-filled basin, the deepest part of which lies between Beryl Junction and Newcastle. Escalante Valley is an agricultural area, and ground-water pumping from the basin-fill aquifer began in the 1920s. Measurements in wells indicate that ground-water levels have declined steadily since the late 1940s and show no recovery during periods of above-average precipitation. The area of greatest ground-water decline (95 to 105 feet) extends from near Beryl Junction to Enterprise. 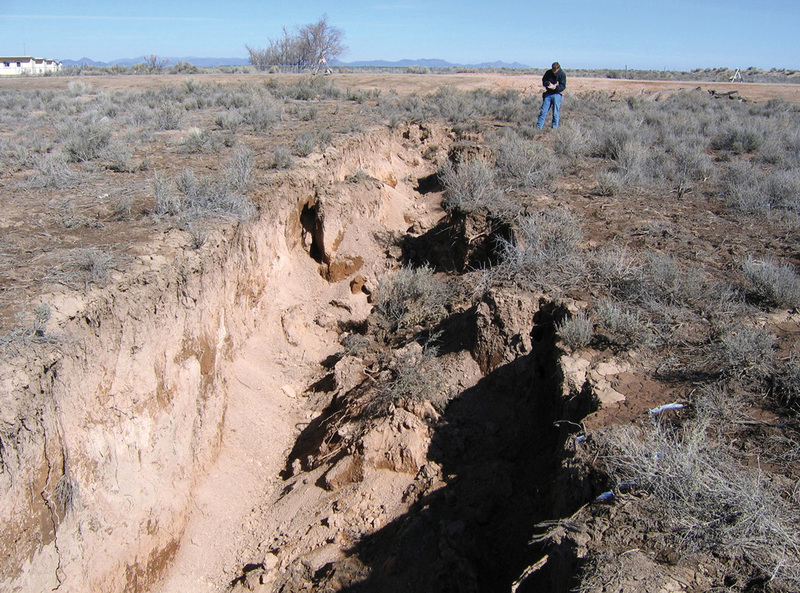 Earth fissures are commonly associated with ground subsidence caused by aquifer compaction, which results from the permanent reduction in volume of fine-grained deposits (silt and clay) within the aquifer following ground-water withdrawal. Fissures up to 10 miles long have been reported in Arizona, and the Las Vegas Valley also has experienced earth fissuring as a result of groundwater pumping. Our investigation showed that the Escalante Valley earth fissures are similar to those that have formed in other western states as a result of groundwater pumping and water-level decline. The Escalante Valley earth fissures extend for considerable distances in a mostly linear fashion across a variety of material types, locally exhibit vertical displacement, and likely extend to considerable depths (perhaps to the ground-water table) based on the volume of floodwater that entered the fissures. Additionally, the fissures coincide with an area of measured ground subsidence (2 to 4 feet between 1941- 1972 and 2005 based on Global Positioning System surveying) and significant ground-water-level decline near Beryl Junction. Other possible causes for the fissures (desiccation cracking, hydrocompaction, surface faulting) typically produce cracks having different characteristics, are limited to clay-rich deposits, or require a large (magnitude 6.5 or greater) earthquake to form. Ground subsidence and earth fissuring may cause a variety of problems including (1) changes in elevation and slope of the ground surface, possibly affecting streams, canals, and drains, (2) damage to roads, buildings, railroads, and underground utilities, and (3) failure of well casings from forces generated by compaction of the valley-fill alluvium. Additionally, surface water diverted into earth fissures may reach the water table and cause ground water contamination. The landowner at the southern end of the longest earth fissure, which extends into an alfalfa field at its south end, noticed that slopes in his field have changed recently, altering surface-water flow directions and causing water to pond in areas where it formerly drained. He also reported that the casing in a well in the southwest corner of his field sheared and failed during the summer of 2004. 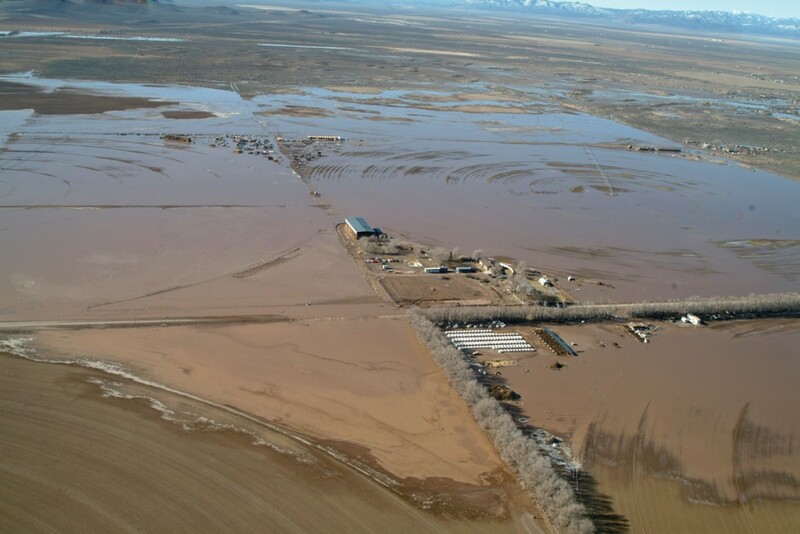 Floodwater that infiltrated and enlarged one of the earth fissures flowed through a cattle feedlot prior to encountering the fissure, and contaminated surface water likely reached the water table in that area. Based on current evidence, the best explanation for the formation of earth fissures in Escalante Valley is long-term ground-water withdrawal, which has caused a significant drop in the ground-water level, permanent compaction of fine-grained deposits in the Escalante Valley aquifer, and ground subsidence near Beryl Junction. We infer that the earth fissures are the surface expression of horizontal tension in the Escalante Valley aquifer formed in response to differential aquifer compaction and ground subsidence in Escalante Valley.